This post is not about me. It is about Jason Scott. Continue reading A word in support of history. Tags: 6502, arcade, bbs, documentary, get lamp, jason scott, kickstarter, tape. 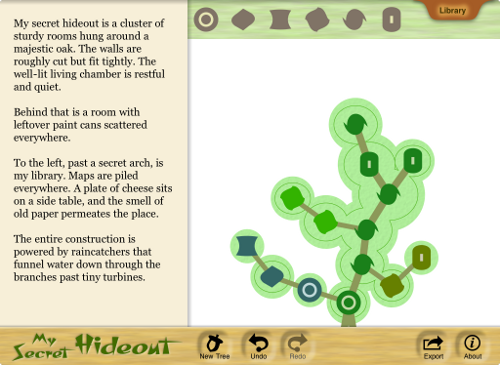 I am delighted to say that My Secret Hideout -- first mentioned here a couple of weeks ago -- is available right now on the App Store. Runs on iPad and iPad 2 (iOS 4.2 or later). The down side is, I don't have any sales reports yet, so I don't know how it's doing. But the up side is that I don't have to figure out tax compliance in 90 countries. I'm glad I don't have to organize everything, is what I'm saying. My Secret Hideout is a wacky, creative thing set in a treehouse. It’s not like any app you’ve seen before. Buy it! Play around with it! My Secret Hideout has no goal, no score, no trophies. Explore it, or play with it, until you find a result you like. Will your treehouse be simple or complex? Can you guide it? What will you discover inside? That's the blurb. There's the link. Go for it. Thank you for your continued generosity. More project news soon. Tags: ios, ipad, my secret hideout, zarf, zarfplan. Now the company has released The Night Circus, a smaller -- I assume smaller -- game in the same model, as a licensed promotional thing for an upcoming book. The boss is no longer looking over my shoulder (his head is now firmly positioned on top of my neck) so I figured it was time to give the thing a try. Continue reading The Night Circus. Tags: casual mmos, casual rpgs, echo bazaar, fail better, night circus.